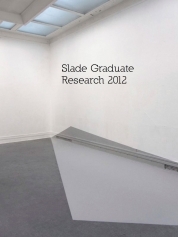 Graduate Research Weeks are held at the Slade Research Centre and provide MFA, MA and PhD students across all three areas with a forum to explore an aspect of their work under a particular research theme. 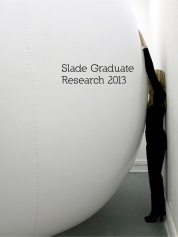 Graduate Research Weeks are held at the Slade Research Centre and provide MFA, MA and PhD students across all three areas the opportunity to explore an aspect of their work under a particular research theme. 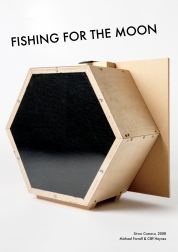 Fishing for the Moon is an exhibition celebrating the work of Michael Farrell, who worked at the Slade from 2003 - 2015. 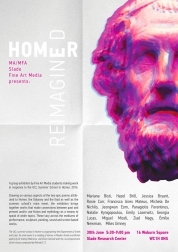 A group exhibition by Fine Art Media students making in response to the UCL Summer School in Homer event, June 2016. Graduate Research Weeks are held at the Slade Research Centre in the Autumn and Spring Terms and provide MFA, MA and PhD students across all three areas the opportunity to explore an aspect of their work under a particular research theme, which can be imaginatively developed in the unique studio space of the Centre. Motion in Form II is a four-day event at the Slade Research Centre, Woburn Square, investigating film and moving image through workshops, live performance, lectures, discussions and a public exhibition of film installations. Graduate Research Weeks are held at the Slade Research Centre in the Autumn and Spring Terms and provide graduate students across all three areas the opportunity to explore an aspect of their work under a particular research theme,The research themes for the academic year 2014/15 were: Body, Colour, Scale, Sound. 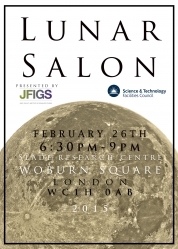 Practice-Led PhD candidate Sarah Fortais borrowed NASA lunar specimens from the STFC and hosted an event titled Lunar Salon at the Slade Research Centre. The Big Painting Project has been a feature of the Undergraduate Painting Area since academic year 2007- 8. 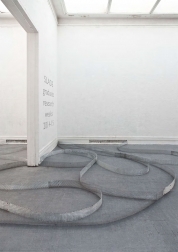 The Rock Room Project is a research and exhibition project based in Graduate Sculpture and was set up in 2013. 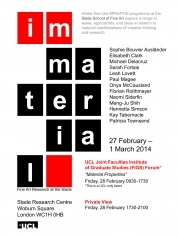 The project collaborates with the Department of UCL Earth Sciences and UCL Museums. On 12-13 November 2015 the Slade School of Fine Art, UCL, doctoral programme will be hosting a two-day research event under the auspices of the European Artistic Research Network (EARN) and the London Arts and Humanities Partnership (LAHP) entitled Against Delivery. Artists from the MPhil/PHD programme at the Slade School of Fine Art explore a range of views, approaches, and ideas in relation to material manifestations of creative thinking and research. Practice-Led PhD candidate Sarah Fortais worked with musician Edmund Gorrod during Sundays in February 2014 in order to film a quintuple exposure video depicting a 5-part drum performance. Difference or Sociality was a student led research project centred around the text ‘Difference or Sociality’ by Scott Lash, written in 1996 for symposium at the Jan Van Eyck Academie called ‘Towards a theory of the image’. 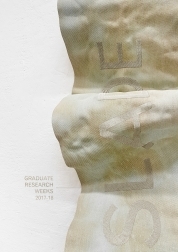 The research themes for the Graduate Research Weeks involve basic notions that continually inform the activity of art-making, and hence are key to the development of artistic research. 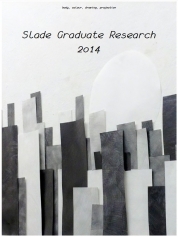 The research themes this academic year were: Drawing, Colour, Projection and Body. MA student Anja Borowicz has been investigating the politics of spatial identity through engaging with packaging and clothing, their design patterns and folding architectural forms. 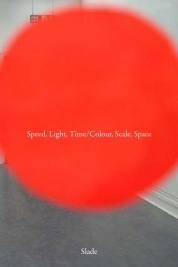 The exhibition and study day Cinema as Object aimed to bring into relief the recent interest in the ‘objectness’ of cinema in art practice and scholarship, and to explore why such focus and interest has emerged at this moment in time. 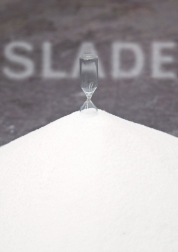 The first Slade Performance Day offered an innovative, non-hierarchical platform for discussion for over sixty Slade staff and students (from BA/BFA, MA/MFA, MPhil/PhD) to share their work and research in performance. Andrea Canepa obtained a grant from the Fundació Pilar i Joan Miró a Mallorca for a three-week stay in London to attend the Slade School of Fine Art. 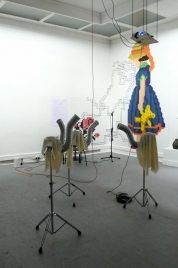 The research themes for the Graduate Research Weeks involve basic notions that continually inform the activity of art-making, and hence are key to the development of artistic research. The research themes this academic year were: Drawing, Colour, Big and Body. Videoooooh, a Slade Olympic-related initiative, took place at the Slade Research Centre, Woburn Square, London WC1H 0AB, from 12noon - 5pm, 24 July - 3 August 2012. 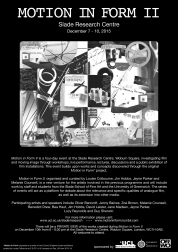 The research themes for the Graduate Research Weeks involve basic notions that continually inform the activity of art-making, and hence are key to the development of artistic research. 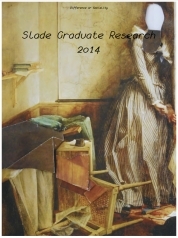 The research themes this academic year: Colour, Material, Body, Extra-Large, Light and Shadow. 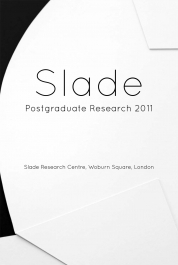 The Slade Research Centre, Woburn Square, has hosted collaborations and events involving researchers from many different fields, from the Slade School of Fine Art and UCL, as well as researchers and practitioners from the wider community nationally and internationally. This project comprised six separate weeks of concentrated activity by clusters of graduate students electing to work under the respective umbrellas of specific research themes: speed, light, time, colour, scale and space. Working with the Slade School of Fine Art, UCL in London, four artists – in China, Uganda, Israel and Australia –each filmed a 12 minute video in a locale connected to their work, under the title The View From Here. The Voice and Nothing More (vanm), curated by Sam Belinfante and Neil Luck, was a week-long festival exploring the voice as both medium and subject matter in contemporary arts practices. Henrietta Simson, Clare Winsten Scholar was at the Slade Research Centre, from Monday to Friday 17-21 November 2008, developing work from her research in Italy. 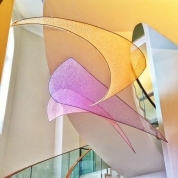 During the Spring of 2008, Vince Dziekan was a visiting research fellow with Slade Centre for Electronic Media (SCEMFA), based at Slade Research Centre, Woburn Square. To mark the 40th anniversary of John Cage's seminal publication Notations (Something Else Press, 1968-9) Notations 2008 presented a range of investigations into what notation is - and can be. Grahame Weinbren was artist-in-residence at the Slade School of Fine Art in the Autumn of 2007.